Tribal communities are untouched by the modern world and influence. India has a vast tribal culture in different states and one of the finest examples of such beautiful untouched tribal communities are the tribal people of Nagaland. Exclusive Nagaland Tribal Tour Package will take you through the lanes of those tribal people where you can have a gala of time with the locals. A land of captivating and beautiful folklore is passed down to the tribal generations through the attribute of word of mouth, Nagaland is a place where folk songs, music, tragic love tales, and poetic love rhythms are relished to the core. 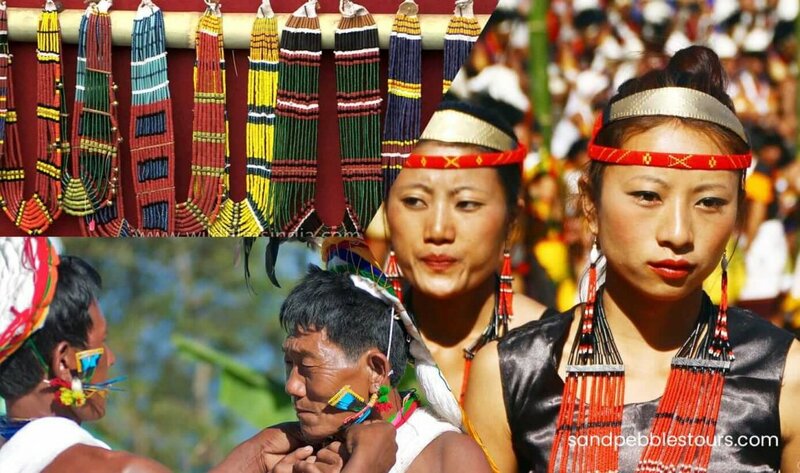 Get yourself indulged into their stories with Exclusive Nagaland Tribal Tour Package. In Nagaland, music forms the integral part of the tribal- folk music highly eulogises the ancestors, the warriors and traditional victors, soft poetic songs blended with love tales immortalises the retrospective tragic past, the songs narrated through Gospels touches the soul of the tribal and the contemporary tunes renders an exciting and exquisite feel to the tribal making them tap their feet on repeat. Exclusive Nagaland Tribal Tour Package gives you an opportunity to dance to the soulful folklore. Can you believe even today a place where people actually make their own ornaments exists? Naga Tribal people are very skilful when it comes to handcrafted things o weaving. Different tribes have their own speciality. Explore all the possibilities with our Exclusive Nagaland Tribal Tour Package. Upon your arrival at Dimapur airport you will be received and transferred by road to Kohima for the night stay. Overnight stay at Kohima. This morning we take a sightseeing tour of Kohima, the capital of Nagaland. The main tribe in the area are the Angami but there are also both the Rengma and Zeliang tribes here too. The village also has a World War II memorial which is well worth a visit. The state museum of Kohima is a great place to learn more about the Naga tribes and their unique ways of life. Later on we drive to Khonoma Village where we begin our 02 nights stay with a local tribal family. Overnight at Khonoma. This morning we take a walk around the village and learn about different aspects of their lives and what makes them unique. The Angami Naga is known to be the last bastion of the Naga warriors and there are a number of memorial stones that celebrate their achievements. The village also has a very interesting water system where the water is piped long distances using bamboo. This village is very iconic in that it is surrounded by green rice terraces. Overnight at Khonoma. On day 4 we drive to Touphema, another Angami tribal village where we spend the following 2 nights. Touphema has a number of chalets built in traditional Angami fashion and guests will be greeted with superb Angami hospitality. There are guided walks to go on to nearby peaks and paddy fields. We have the opportunity to visit local homes and gain a fascinating insight into the wonderful myths, legends and stories of the Angami people. There is also a museum displaying traditional jewellery, clothing and other artifacts. Overnight at Touphema. On the morning of day 06 we take a drive to Mokokchung. On the way we stop at Wokha which is the district headquarters of the Lotha Nagas. The Lothas are famed for their splendid colourful dancing and singing. After a visit here we head onto Mokokchung for the next 2 nights. Overnight at Mokokchung. We woke up in the village of the Ao Naga tribe. The majority of this tribe are Christians and have been since about the 19th century and they are one of the most literate tribes of all the Nagas. We also take a visit over to the small village of Mopunchukit. Despite its size Mopunchukit has an informative museum and a church in the village. The last stop of the day is to the village of Longkhum. Longkhum is a hill top village once used as the battle ground for the infamous head hunters. It is commonly believed by the Ao Nagas that the spirits of dead people are manifested in the local eagles that nest here. They also recommend that visitors come through the village twice as the first time one’s soul is often left behind. Overnight at Mokokchung (The beautiful stepped landscape of Nagaland). Mokokchung – Tuensang. After breakfast on day 8 we drive to Tuensang, the largest district of Nagaland, which borders Myanmar in the east. Located in the foot hills of Mount Saramati – the highest peak in Nagaland, Tuensang is a region of outstanding natural beauty with lush valleys and rugged hills. The main Naga tribes of the region are the Chang, Yimchunger, Khiamungan, Sangtam and Phom Nagas, each with their own colourful dress and rich cultural heritage. This morning we depart on our journey to the last of our tribal villages. The district of Mon is both the most northern and the most eastern of all the districts in the Nagaland. It is home to the Konyak Nagas who are by far the largest in numbers of all the different Nagas and also the most recognizable. They have tattoos all over their face and hands and as a tribe are famous for their muzzle loading guns. The Konyaks are the only part of the Naga tribes that use the institution of village Angh (hereditary chief). Overnight at Mon. On our second day in the village we take a visit to the chief’s house in Shangnyu village. Moving on we pop into Longwa, this is the biggest village in Mon and stretches across into neighbouring Burma. The Angh of this village has jurisdiction on both sides of the border. Overnight at Mon. Our third day continues on from the second with more exploration of the local villages. Overnight at Mon. This morning we say our goodbyes and everyone is transported to the airport for their flights for onward journey.